Lorei Medspa in Weston has the latest laser equipment to safely and effectively remove those unwanted spider veins on your face and/or legs. Laser treatment for spider and varicose veins. Laser and Pulsed Light treatments are being used as an alternative to or to complement sclerotherapy for small veins or spider veins. They all work on the same basic principle: a light beam is pulsed onto the veins in order to seal them off, causing them to dissolve. Successful light-based treatment requires adequate heating of the veins. Several treatments are usually needed for optimal results. Our location in Weston, Fl, has the equipment and staff to perform this procedure, call or contact us for your free consultation. There are a variety of lasers and light sources being used to treat surface leg veins. These include the long-pulse alexandrite, diode and long-pulse NdYag lasers as well as intense pulsed light (IPL) devices. These light devices are generally used with cooling of the top skin layer with cool gel, chilled air or other cooling methods. Cooling helps to reduce discomfort and lowers the risk of injuring the skin. At Lorei Medical Spa, we use the Candela GentleYag laser that provides excellent results with comfortable treatments and it is considered the gold standard. 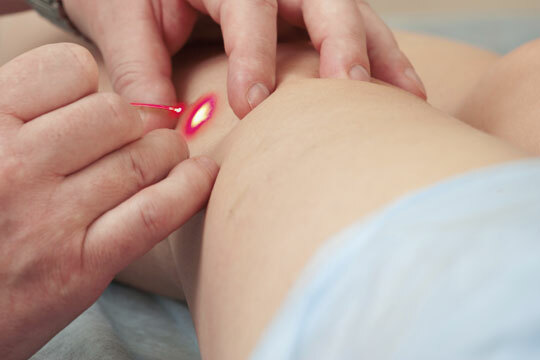 The laser light is delivered through a small handpiece and pointed directly over the skin, the light is absorbed by the veins and the blood inside them is coagulated which is then absorbed by the body. After the treatment, the skin will have a reddish, cat-scratch appearance that generally disappear in 1 to 2 days. Usually 2 to 4 sessions are required for best results.